This block is a smaller variant of the Large Thruster, otherwise known as the ``Ion Thruster``. It moves a ship (grid) in the opposite direction of the exhaust point. 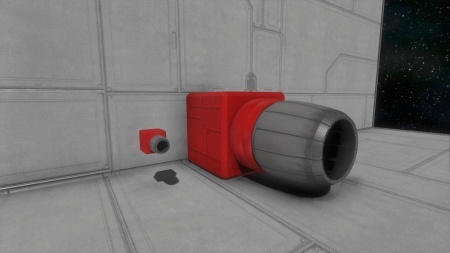 The Small Thruster provides small amounts of thrust, but are cheap to construct up front compared to their larger counterpart, Large Thruster. As of patch 01.022, Large Thrusters will damage anything behind them for up to 7 blocks in a cross pattern. If the space directly behind the thruster is clear, then the blocks on the side will not take damage. For more information on all thrusters and their mechanics, see Thruster. Ion Thrusters are used to move a ship (grid) in a specific direction, and also used to stabilize it's position with inertial dampener (toggled with default 'Z' button). In order for a grid to be entirely stable, thrusters must be placed in the front, back, left, right, top, and bottom positions. Ion Thrusters don't require any type of fuel other than energy sources such as a Large Reactor in order to function. They can run on any amount of power, however their full potential can only be used with larger amounts of power. If your ship is completely still in space, your thrusters will remain in standby mode and only will draw bare minimal amounts of power. If on a multiplayer server with a PCU limit, a Large Thruster will use far less PCU than the equivalent number of small ones. In fact just one small holds the same value as a large one. This page was last modified on 28 February 2019, at 12:38.